On your arrival at airport, you will be picked up by our representative at the airport and will be dropped at hotel for check-in. After that we will next head towards our Bali Jungle Safari Package. With the budget friendly Bali safari and Marine Park price you can have an amazing fun filled and thrilling today. You will be taken into an open forest area with you being trapped in a safety cage and there you can encounter with plenty of wild life species. You will also have the chance to see piranha in the fresh water aquarium. Our Bali holiday package also has the provision of water park and slides at Marine Park for the children to give a fun filled day. Enjoy the overnight stay at Bali. Early in the morning, have the breakfast and then fly to the Flores where you can enjoy the Komodo National Park Package by having the glimpses of Dragon. You will be checked into the Komodo Boat after reaching Rinca Islands where you will be given warm welcome along with the complementary drinks. You can go for trekking at the Islands along with the guide and there you might encounter various small dragon lizards. At the end of trekking you will find a mesmerizing waterhole. It is strictly advised to go on the trekking under the supervision of guide. Stay overnight at the Boat. On the 3rd day, early in the morning, we will head towards Padar Island with our Bali wildlife tour packages and there from the top you will such a wonder of nature that will leave you awe struck. From the top of hill, you get the view of three islands and all of different color. By afternoon, you can explore more of your Bali travel package by visiting the Pink Beach which has the contrasting water shade of Blue and Pink offering a charming view. By evening you will have a flight back to Bali. Have a night stay at your hotel in Bali with delicious cuisine. If your flight is by late afternoon or evening then in the morning you can Bali sightseeing tour of amazing temples like Uluwatu Temple and Tanha Lot Temple which are built around the edge of a cliff with sea waves splashing on it. The guide or representative of our Bali Wildlife Adventure Package will drop you at the airport by your required time. If you have a love for nature, beaches as well as wildlife then there could not be anything better than our Bali Wildlife Tour Packages. With our Bali holiday tour, you can spend along weekend not only at the beaches but also around the wildlife species. 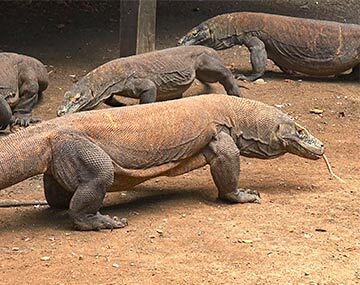 The trip to Bali from India gets more thrilling when you get the chance to see dragons or have a jungle safari in an open forest where you are in cage. Our three nights and four days of Bali wildlife tour package is inclusive of all from cab to hotel and from tourist spots to travel guide. Here is the detailed itinerary of our marvellous Bali Wildlife holiday packages.